He doesn't always file lawsuits. Only one of the dueling lawsuits between "The Most Interesting Man in the World" and his former talent firm is substantial enough to keep the court's attention. The legal fight started in October, when Jordan Lee Inc. and William "Butch" Klein sued former Dos Equis ambassador Jonathan Goldsmith for breach of contract, seeking their share of his most interesting paycheck. Goldsmith countersued in February, claiming they disclosed confidential information about his contract and jeopardized his future business with Dos Equis. Los Angeles County Superior Court Judge Barbara A. Meiers granted JLI and Klein's anti-SLAPP motion to strike Goldsmith's complaint in a Wednesday morning hearing, according to their attorneys. 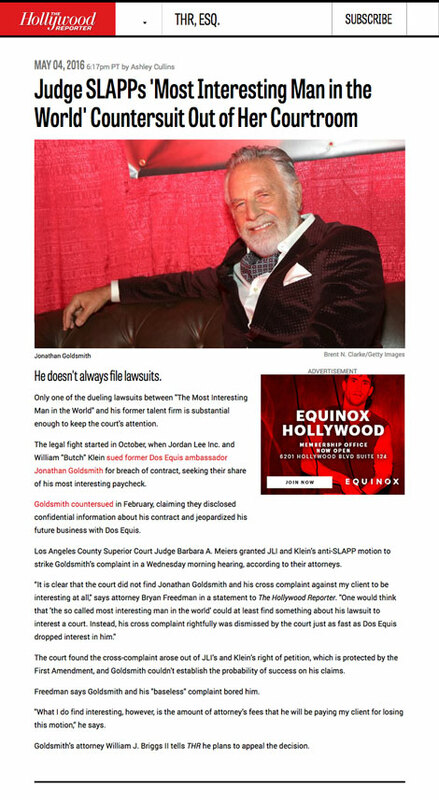 “It is clear that the court did not find Jonathan Goldsmith and his cross complaint against my client to be interesting at all," says attorney Bryan Freedman in a statement to The Hollywood Reporter. "One would think that 'the so called most interesting man in the world' could at least find something about his lawsuit to interest a court. Instead, his cross complaint rightfully was dismissed by the court just as fast as Dos Equis dropped interest in him." The court found the cross-complaint arose out of JLI’s and Klein’s right of petition, which is protected by the First Amendment, and Goldsmith couldn't establish the probability of success on his claims. Freedman says Goldsmith and his "baseless" complaint bored him. "What I do find interesting, however, is the amount of attorney’s fees that he will be paying my client for losing this motion,” he says. Goldsmith's attorney William J. Briggs II tells THR he plans to appeal the decision.